As I approached the bridge I saw the creepiest cactus of all times - literally creepy, in the sense that it looks like a gathering of snakes. 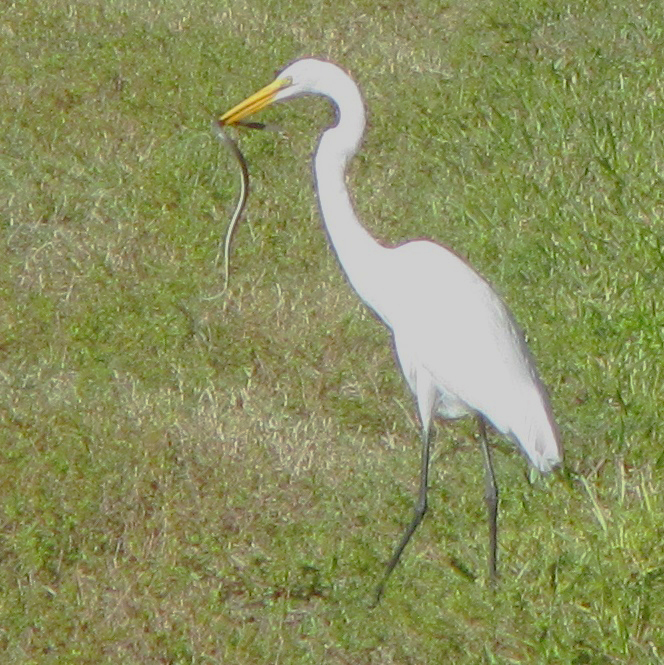 Then as I left the bridge on the other side there was a real snake - in the mouth of a snowy egret. The bird was juggling the snake to try to get its head into its mouth. I interrupted this effort as I approached. It flew off to try again in a more secluded setting. There were birds on the beach, too. Besides the pelicans shown in the headline photo there were Great Blue Herons, normally a bird that keeps its distance from humans - these had taken to hanging around fishermen hoping for a hand-out. When you're hiking the beach all day a bit of trail through greenery seems special. I hiked a path behind the dune in Sebastian Inlet State Park for about a mile. The dune vegetation here is entirely different from what I'm familiar with in the mid-Atlantic. Most of eastern North America is in a cold spell right now, and it has even reached central Florida. It was a bright but unseasonably cool day and breezy with high temperatures barely reaching the low sixties. The ocean water temperature in the surf is similar - in the low to mid 60's - so even the snowbirds (the human kind - having migrated from up north) were absent from the beach. I was glad to have the space, but was hoping for some of the weather they are here for -- average highs are in the low 70's, which means low 80's are as common as the low 60's we're having now. Maybe before I finish with the beach walk the pendulum will swing, but it seems doubtful. I'm 'eating' beach so quickly that I'll soon be back inland headed toward Lake Okeechobee. We'll see.